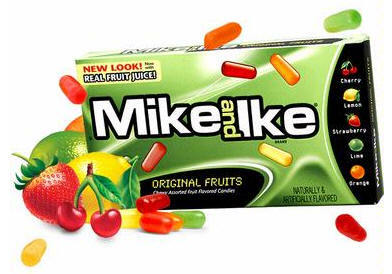 Mike and Ike Original Fruits Candy 24ct box - The Original MIKE AND IKE chewy flavored candies with real fruit juice flavor have been loved by kids and adults alike for over 65 years. There's nothing like the original ! The Original MIKE AND IKE chewy flavored candies with real fruit juice flavor have been loved by kids and adults alike for over 65 years. There's nothing like the original !